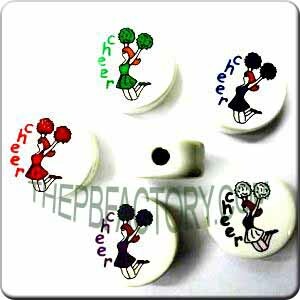 Large ceramic disc bead Cheerleader, Assorted Color pack. 21 mm. Horizontal hole of 4 mm. (see image for exact location). 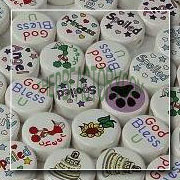 Sold 25 units per package: 5 colors x 5 units each. The five colors are: Black, Red, Green, Lavender & Blue.